Wondered why Island Roads are frantically re-painting lines on unrepaired roads? This is something we’ve had quite a few Islanders speak to us about over the past few weeks. OnTheWight gets to the bottom of what looks to be the real reason for the rush. If like OnTheWight reader, Keith Wolton, you’ve been wondering why you keep seeing Island Roads repainting lines on roads that clearly need resurfacing first, we have been diggin to find out the the answer for you. 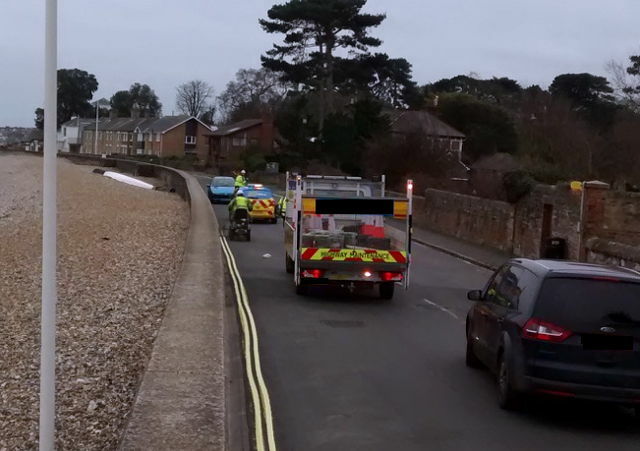 Like many others who have got in touch with OnTheWight recently, Keith was surprised to see lines being repainted on a road that quite clearly needed attention in other ways. “I was going for quiet run this morning, when I was amazed to see lines being renewed on a road surface of poor quality. The place in question was Seaview Duver, between Puckpool Park and Seaview. Island Roads announced last month they would be renewing lineage across the Island as part of their winter programme of works that concentrates on areas other than highway resurfacing (which is more prone to disruption during inclement weather). However when OnTheWight got in touch with Cllr Phil Jordan (the Executive member in charge of the PFI) he was able to shed a little more light on the mystery. Cllr Jordan explained that Island Roads were contractually required to bring all lineage across the Island up to the required level by 1st April, otherwise they’d be looking at hefty penalties. It’s all part of their half yearly Milestones built into the PFI contract. We’d asked whether Island Roads would be paid twice to paint the lines, before and after the resurfacing. You can at least breath easy on this – He gave us an emphatic “No!” in response. 29 Comments on "Wondering why Island Roads are frantically re-painting lines on unrepaired roads?" The real reason? The demand for IR cash flow to leak eventually into VINCI/Meridiam accounts in tax havens. Simples! a little more simple actually…. There is a milestone clause that calls for all lineage to be brought up to a required specification before 1st April 2015…! As Council Tax paying Islanders, what can we do to help the IWC ensure Island Roads has our money withheld from them? …. and there is no “milestone get out clause” favouring IR? Check again Phil! According to the news, the West Midlands are rushing to spend their Government money for the potholes and road repairs. In Stafford, Walsall, Birmingham and Coventry they have to spend it by April. We have none because Turner’s lot have said we have a PFI contract who are fixing our roads adequately. They are rushing it too. Some shocking line painting around our area. Lines are very crooked! Please let me have the details of where this is….? Have you been drinking DH? I’m sure if we dig deeper, there will be more to the fact that roads haven’t been resurfaced due to inclement weather. I saw four man lowing a kerb in my close. They did a real good job. I heard a my wife call, “Don you breakfast is ready”. Oh dear! I’d been dreaming yet again. Don’t let up on them, I’m really impressed at how you are tackling this head on. Will there be regular updates to the Executive meetings on the performance of the contract? Yes, there will, when appropriate. Don’t confuse IR workers with IR management and their financial leech owners! Nowadays IR can hide from FoI, something that the IWC could not do. Some workmen work hard some do not. What annoys people is seeing a set of traffic lights around a couple of lorries with people sitting in the cabs reading the paper. Near Sainsburys Garage,temporary lights had been placed. One young man was sat on the kerb in his fluorescent jacket and protective hat apparently chatting on his mobile. Good on site supervision is needed. do you want to let me have exact details…? Couple of example pics / details on there way to you. Instead of painting yellow lines for contractual reasons they would have been better employed filling the water filled crater that destroyed my tyre, rim and wheel trim that wasted a whole daylight day in th afterwffects of their negligence, what a Bunch ???????? ?